There are some situations where people are looking for a more temporary (yet still durable and effective) room treatment. Maybe you have a garage, or a practice space, or a place where you are looking for a usable solution that isn’t a permanent installation. Here is a great (not to mention tax deductible) treatment that can address many of the isolation and absorption issues of a space, while remaining durable (Washable), and easy to remove and reuse. Enough StratiQuilt™ Double-Faced Barrier Blanket to cover all of the wall and ceiling surfaces of the room you need to treat. Misc. hardware to attach 2”x4” lumber to walls. Attach the 2”x4” lumber to the walls with enough spacing to line up the grommets on two overlapped edges of the StratiQuilt™ blankets – if you have purchased the roll, the finished edges are 4 feet wide. Leave enough room to overlap the edges and bolt the quilts to the 2”x4” lumber as shown in the diagram above. Continue around the room, overlapping the edges of the StratiQuilt™ blankets to seal off the room. The blankets can be left loose over doors to allow for entry and egress while maintaining a good acoustic seal. Other than it being very simple to install, take down and move with minor modifications to the structure, it performs a few vital acoustic tasks – all with one product. 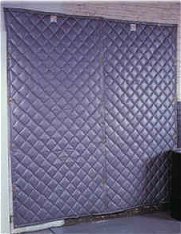 The StratiQuilt™ design is two layers of quilted acoustic fiberglass with a layer of BlockAid® barrier in the middle. The BlockAid® help the soundproofing of the room by it’s STC of 29, which will add significant isolation to the room. Mounting on the 2”x4” lumber is not just done for ease – adding the air gap behind the barrier increases both its STC and NRC allowing it to work as a limp mass barrier/absorber. The material absorbs on both sides (being double-faced), forcing in-room reflections to be attenuated immensely through the many layers of material it must pass through. And on a final note, this economical start-up solution has the benefit of not being a “Building Material” for tax purposes, allowing for its immediate deduction as an expense. Record your garage band without sounding like you’re in a garage, Try StratiQuilt™. This entry was posted on June 6, 2013, 9:00 am and is filed under Absorption, Animal Shelters, Articles, Broadcast Facilities, Construction Sites, DIY, Home Entertainment, Home Theater, HOW TO, Music Rehearsal Spaces, Music Tracking Room, Product Applications, Products, Recording Facilities, Recording Studio, Sound proofing, Studio Control Room, Vocal Booth, Voice Over. You can follow any responses to this entry through RSS 2.0. Responses are currently closed, but you can trackback from your own site.